In our fractured, post-truth world, no one can decide how to pronounce "Blink-182"
As if the twin scourges of populism and nationalism weren’t doing enough to drive the world’s people apart from one another, we’ve now learned that the promise of a global village is being further betrayed by, of all things, how people pronounce “Blink-182" in different countries. Late Late Show writer Ian Karmel, however, shared an alternate version. Showing the extent of this global divide, another, presumably British Twitter user named Ed Perchard expressed bafflement at the initial bafflement. James Corden was soon drawn to the discussion and introduced another, totally unnecessary wrinkle. ... and before long, Blink-182's Tom DeLonge and Mark Hoppus arrived to give their two cents. 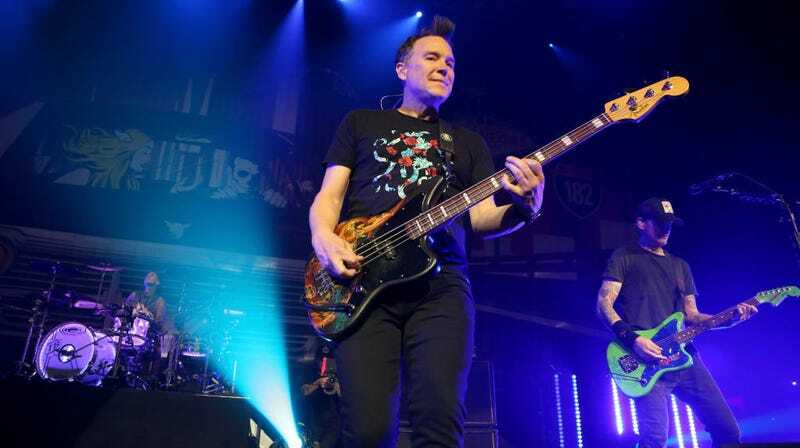 DeLonge, unhelpfully, provided yet another pronunciation and Hoppus a stylistic note that we can not follow here. In all of this, we’re reminded of how large and unknowable our world truly is. The digital age, which utopians claimed would make borders meaningless, has turned out only to be a tool to further illustrate the arbitrary divisions that mark our world. It’s important not to underestimate the impact of these fierce differences: war has started for reasons just as stupid as two groups of people being unwilling to respect the various ways you can say the name of an early ‘00s mall rock band.